L to R. Joe Cook, Estimator; Zeph Bryant, Project manager; Chapman Smith, President; Jim Quine, Controller; Shapleigh Smith, Project Manager. 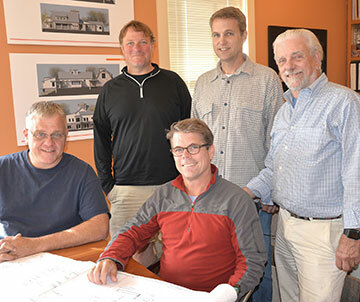 Shapleigh Smith and Cleveland Patterson, longtime residents of Stowe, formed Patterson & Smith Construction in 1991. Chapman Smith, son of Shapleigh, joined the company in 2003, and has since taken the reins as President of the company. Chapman brings years of hands-on construction experience and a degree in Architectural Engineering Technology. His company leadership also ensures a seamless transition of the company’s abilities, strengths and philosophy into the future. Chapman shares a strong commitment to customer service, community and excellence, and delivering stunning results. The foundation for Patterson & Smith Construction’s success is teamwork and we are fortunate to have a talented team dedicated to building high quality homes, estates and commercial spaces. Zeph Bryant joined us as a project manager in 2013. Zeph has been in construction his entire adult life and in that time, he has worn many hats on a project site. He has a range of experiences in the construction industry that give him a full understanding of all the pieces to a project. Jim Quine joined us in 2014 as our office controller. Jim has extensive experience in small business accounting and project management, and draws from that experience to keep our company running smoothly. Joe Cook, our estimator, completes our well-rounded management staff. We are proud of the recognition we receive and strive for excellence in all facets of our business. 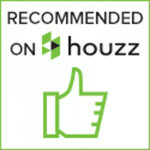 Best of houzz design award '16.